So you get that you are in a bad relationship (or a cult). As soon as you realized you were dealing with a psychopath or narcissist you went looking for information. You searched the internet for information, you have probably read a couple of books; you have watched several videos and you are talking with friends to try and make sense of what is going on. Are you at the stage where you feel like you have plenty of information now? You can see that the relationship is abusive. You know what it's like to be on the receiving end of it. You recognize how your story is similar to the stories of many others. You may have been at this for months or even years. Many have been to therapy or counseling as well and while the therapist or counselor may have been supportive, it seems that they just don't fully grasp your situation and there is little or no solid practical advice for you. How am I supposed to respond when he or she does x? What do I need to do to get him or her out of my head? How can I stop myself getting upset when I read the emails? What do I do when they trigger me? How can I get rid of this fogginess in my mind? So what do you get in the 54 Practical Tips For Dealing With Psychopaths and Narcissists? Each tip is organized around a particular aspect of the relationship, whether the relationship is an intimate relationship or a cult. In order to be able to change things, it helps enormously to understand something about the motivations of the manipulators, the dynamics of the situation, and the effects of the techniques being used against you. To this end, I give information about your situation, why the manipulators do things the way they do, their attitudes, what effect it has on you, how specifically they are manipulating normal human relationship patterns and so on. Understanding these things means that you can begin to see the patterns of abuse and how the manipulator is taking advantage. Understanding the background makes it's easier for you to understand why the manipulators treat you the way they do. It also gives you a new framework for making sense of what is actually happening. Armed with this information, the things that you need to do, (or stop doing!) will be more obvious as well as easier to do because you understand why you are doing them. With Psychopaths and Narcissists now! Although I am offering tips for dealing with psychopaths and narcissists, I do not suggest that you use these tips as a way to 'manage' a manipulator. Nor do I suggest that you use them as a way to cope so that you can stay in the relationship. I work on the basis that, with very few exceptions, a person in a relationship with a manipulator loses. The abuse, bad treatment and humiliation that one suffers at the hands of psychopaths and narcissists is not worth whatever benefits that may be considered to be present. In other words, whatever benefit you think may be there for you, comes at an excessively high price. Leaving the relationship should be priority number one. You cannot hope to fully recover from the damage while you are still in the relationship. And once you are out, you need to stay out. This is often very difficult because of the dependency of the pseudopersonality on the manipulator. There may be other complicating factors, too, such as a divorce or the presence of children. However, there are ways to minimize the opportunities for the psychopath or narcissist to continue the manipulation and abuse and some of these are covered in the book. Leaving a relationship with psychopaths and narcissists is the best thing you can do. I think that trying to manage them is a huge waste of your time and effort, and indeed, your life. They are much more devious and cruel than you could ever be and they have no motivation to change. I'm David Mc Dermott and my desire to help others led me to qualify in medicine and I worked as a surgeon for several years. I was caught by a manipulative woman in a destructive relationship and when she left I was left with no money, no house and a very disillusioned view of society because of the lack of legal or any other type of support available to people in my situation. Of course, I blamed myself, trying to figure out what I had done wrong. Very shortly after, I was recruited into a personal development cult where they offered me a way out of the pain and suffering I was experiencing because of the failure of the marriage. I realize now that my caring nature was also used to entrap me. I became the number 2 in the group, working closely with the leader in giving courses, mentoring others and basically recruiting new members. After 10 years, I managed to leave. I had had enough of the lies, the money grabbing, and the very poor treatment at the hands of the leader. I realized that my own wants had been put to one side in favor of the group's idea of changing the world... which wasn't happening either! These tips are best used as you are working your way out of the relationship and they will often help you understand and make sense of what has been happening to you. That's why I provide information about how and why the manipulation techniques work. I believe that the more you understand about the nature of mind control, the better. Once you understand what is going on, the easier it is for you to make the decision to get away, and stay away, from these types of people. It’s very important to understand the dynamics of the various situations in relationships with these types. Much of the time, the unfortunate victim does not realize what is being done to them and they are unaware of the profound influence that the manipulator is exerting on them. Having this knowledge is important for several reasons. It reduces the power the manipulator has when you can recognize the influence technique being used against you; then you have more options about how to respond. It also explains why the change in behavior suggested is actually useful, how it fits into the overall scheme of things. And knowing why you need to act differently makes it easier to change what you have been doing. You are not just doing something because someone tells you to (You have done enough of that already!) but rather you are deliberately creating a way out of the messy situation you have been dragged into. The tips are not in any specific order. I decided to do this even though some of the ideas are related because this way you get regular reminders of some ideas. And as we shall see, repetition is important. Some of the tips are suggestions for how to act in certain situations; some tips are about how a change in thinking or a change in belief is necessary and some are organized around things that it is useful for you to stop doing. Either way, these tips have been useful for many others already and you will be able to put them into action straight away, too. Psychopaths and narcissists take every opportunity to manipulate, control, abuse and generally run you down. This includes the sending of emails. If this sounds familiar, a very useful exercise when you receive an email is to not scan it. Do not have a quick peek and do not read it from start to finish. Instead, read it one line at a time. Read the first line, then stop. You can do this in any way you like, for example, you can cover the screen so that you can only see one line at a time, or you can print it out and do the same thing, or you can have a friend or family member read the email to you, but only one line at a time. When you have read the first line, have a think about it. Is it true? Is s/he making up stuff about you? Is s/he distorting the facts? Are you being accused of something that he or she is actually doing? When you have adequately considered the first line, read the second. Then examine that. Go line by line until you have read the whole thing. An email from a psychopath or narcissist is often written to deliberately upset you. They will accuse you of stuff, use derogatory language, press your hot buttons, distort information to make you seem like you are the one who is mad, bad or sad, and generally try and get you emotionally wound up. If you read the whole email quickly, it's often the case that there is so much abuse being hurled at you, that you won't be able to stop the torrent of emotions that follows. An outsider may read the email and say that it doesn't seem that bad. But you recognize that there is a certain tone to it, or certain words or phrases used, or a manner of being calm or pleasant, and that these things are deliberately designed to upset you (because they have been used in the past to needle you). And even though you recognize these things, the sheer amount of them overwhelms you. So the trick is to break the email down into much smaller pieces and deal with each individual piece before moving onto the next one. This way there is no avalanche of information to deal with and when you can see what he or she is doing in each sentence, it becomes so much easier to deal with. The manipulator no longer achieves the result s/he is going for - your being an emotional mess who can no longer think or function! Reading an email this way obviously takes longer, but at the end, you can still think and reason through things as opposed to having your head all over the place for hours or even days afterwards. The investment in time is worth it. One of the characteristics of psychopaths and narcissists is that they don't consider themselves responsible for things that go wrong. Even when it's obvious that they have made a mistake, they don't feel the need to apologize. It's much more likely that they will blame someone else, typically you! However, anything that goes well for them, or even anything that goes well around them, they will quickly take credit for. Victims of psychopaths and narcissists often report that they cannot remember the manipulators ever saying sorry. They will be very quick, though, to demand apologies when something happens that they don't like or don't want and they act all offended and hurt. When we apologize, we are recognizing that we made a mistake, we are taking responsibility for it and it's typically a submissive posture. We may be expressing shame and embarrassment. We make ourselves vulnerable, because we don't know how the apology will be received, whether we will be forgiven or punished. And not apologizing may be taken as a sign of disrespect. And it's also for those reasons that they don't apologize themselves. They don't want to put themselves in an inferior position and give you the upper hand. And besides, they don't feel shame, embarrassment or remorse, so there is no drive to apologize to relieve those sensations. Some psychopaths have explained that they don't actually know what it means to be sorry. The concept does not actually make sense to them. That doesn't mean that they don't know how to use it against normal humans who have the full range of emotions. And they use it in two ways. The first, as I said, is to insist on their victims apologizing, even for things that are not the fault of the victim! The second way they use it against people is when they apologize themselves. They can say sorry, they can produce tears, they can promise the sun, moon and stars, they can swear that they will change and that they will never do that upsetting thing again. They can be very, very convincing when they apologize - but 5 minutes later they are doing the same abusive, upsetting behavior as before. The way to deal with this is the rule of 3's. If a person does something that upsets you and you expect an apology and none is forthcoming, you take note. The second time it happens, you are counting. And the 3rd time it happens, that's a deal breaker. Likewise with apologizing and continuing to do the upsetting behavior. The first time it happens, well, it can happen to anybody. We have all at one time or other said we wouldn't do something and then inadvertently, we do it again. But a second time, now we are on high alert. The third time someone does something having promised they wouldn't, they are out of our lives. And it doesn't have to be 3 times. You get to decide. It can be 2. If it is something big and significant, it can be only one time. The important thing here is that you decide what behavior is and what behavior is not acceptable to you in a relationship. The good news is that it costs only €9.79. This money will save you time, effort, money, and will help you avoid a lot of heartache and suffering. There is a 30 day money back guarantee with the 54 Practical Tips For Dealing With Psychopaths and Narcissists. If you find the information is not suitable, send me a note on the contact page and I will happily refund your money. That means you won't have to fight to get a refund! The 54 Practical Tips For Dealing With Psychopaths and Narcissists comes as a .pdf file which you can read on any computer, whether it's a PC or a Mac. (It is not a paper book.) Of course, if your ebook reader reads other formats, you can simply use your favorite program to change the .pdf into the required format. IMPORTANT! 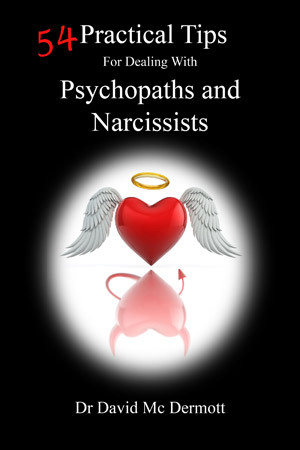 In both cases the confirmation of payment page will have a link to click on to go to the page where you can download the 54 Practical Tips For Dealing With Psychopaths and Narcissists ebook immediately. If you have any difficulties, contact me and I will do what I can to help! The Mind Control Manual sells for €9.49. You can buy both the Mind Control Manual and 54 Practical Tips For Dealing With Psychopaths and Narcissists for €15.42, a saving of 20%!